Clinical Rangers finishing consigned Hearts to a comprehensive defeat at Ibrox in the absence of striker Uche Ikpeazu. Jermain Defoe, Connor Goldson and Scott Arfield scored the goals in a game Rangers controlled despite missing their own talisman, Alfredo Morelos. Ikpeazu was sidelined by a head injury sustained against Aberdeen at the weekend, while Morelos was suspended after a red card against Celtic on Sunday. Steven Gerrard’s side made light of the Colombian’s ban by scoring three times – captain James Tavernier heavily involved in them all – and threatening to add to that tally throughout a convincing win. With Ikpeazu in the stand, Craig Wighton got the opportunity to lead Hearts’ forward line but the visitors caused their opponents few problems during the 90 minutes. Fellow strikers Aidan Keena and Steven MacLean were among the visiting substitutes, while David Vanecek again found himself overlooked. Rangers started strongly and pinned Hearts back, refusing to allow them out of their half at times. Two goals inside the first 21 minutes put the hosts in command, with the third arriving moments into the second half to finish the game as a contest. Gerrard chose to replace top goalscorer Morelos with Defoe and was justly rewarded by the Englishman on the night. Andy Halliday was also banned following Sunday’s melee at Celtic Park and that prompted a recall for Jon Flanagan at left-back. He was making his first appearance since January 30 in the Scottish Cup at Cowdenbeath. 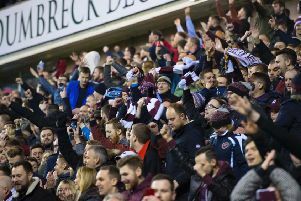 The home side needed a response after losing to their city rivals but Hearts were aiming to build momentum after a hard-earned weekend success. They almost gifted Rangers an early lead when John Souttar was caught in possession 25 yards from his own goal by Ryan Jack. The midfielder prodded the ball through to Defoe for a clinical finish denied by an offside flag. A 20-yard drive by Tavernier was beaten away by Hearts goalkeeper Zdenek Zlamal as blue shirts controlled proceedings. The opposition were hemmed in their defensive third of the pitch. It was no great surprise when that dominance produced two goals inside five minutes to afford Rangers a good degree of comfort for the rest of the evening. First, on 16 minutes, Arfield slipped a pass to Tavernier dashing into the penalty box. The right-back’s initial shot was blocked by the diving Zlamal but Defoe rifled the rebound high into the net first time. Goldson nodded the second five minutes later, glancing Tavernier’s free-kick away from Zlamal into the net from a central position. From then on, Hearts were negotiating a steep upward trajectory. Captain Christophe Berra did manage to force a couple of saves out of the Rangers goalkeeper Allan McGregor near the half-hour mark. The second was most notable. From Oliver Bozanic’s corner, the Scotland internationalist rose for a downward header which McGregor tipped over his crossbar at full stretch. Flanagan found himself cautioned for a reckless challenge on Bozanic near the interval. Although Hearts had emerged from their shells to an extent as the first half wore on, they had only troubled McGregor on that solitary occasion with Berra. Ambitions of taking a point back to Edinburgh rested on a far more assertive second-half display. Within three minutes of the restart, their flickering hopes completely disappeared when Rangers moved 3-0 ahead. Tavernier’s cross from the right was hit first time by Defoe and, when Zlamal pulled off an excellent reaction save, Arfield was in place to slam home the rebound with aplomb. Teenagers Bobby Burns and Aidan Keena were introduced by the visiting manager Craig Levein with the game now out of his team’s reach. Rangers came close to a fourth goal on 72 minutes when Goldson’s header ricocheted off substitute Eros Grezda and struck Zlamal’s right-hand post before bouncing wide. Keena was eager to make an impression by sourcing a consolation for those from Edinburgh. With 11 minutes left, Olly Lee’s prodded cross eluded him at the back post. The striker then took matters into his own hands with an audacious chipped shot from fully 40 yards out which landed on the roof of McGregor’s net. Jamie Brandon strode forward for a vicious shot which thumped off McGregor’s left post in stoppage-time. However, Rangers closed out the game by maintaining their three-goal cushion and Hearts headed home disappointed. Rangers (4-3-3): McGregor; Tavernier, Goldson, Worrall, Flanagan; Jack (McCrorie 60), Davis, Kamara; Arfield (Grezda 67), Defoe (Lafferty 78), Kent. Unused subs: Foderingham, Katic, Coulibaly, Candeias. Hearts (3-5-1-1): Zlamal; Souttar, Berra, Shaughnessy; Godinho (Burns 58), Djoum (Lee 70), Haring, Bozanic, Brandon; Clare (Keena 58); Wighton. Unused subs: Doyle, Dikamona, Mulraney, MacLean.